I am thrilled to be the assistant fight choreographer for our department’s production of Titus Andronicus. Shakespeare’s bloodiest tragedy features a lot of one-sided violence, like torture and stabbings, rather than the usual back-and-forth two-way violence of a sword fight. The director and designers have planned for the use of a ton of stage blood in performance, which is an element of the theatre that I am unfamiliar with and excited to learn about. It should be an interesting challenge to assist the fight choreographer in balancing the amount of brutality called for with the storytelling needs of the play. It’s the beginning of a new semester here at IU and boy it is hot outside! Thankfully the classrooms are all air conditioned. I have an enthusiastic group of students in my Script Analysis and Introduction to Theatre classes. This semester I have introduced Canvas-based reading quizzes and an all-electronic paper submission policy in order to facilitate student learning. Since the department will be producing the comedy Barbecue by Robert O’Hara, we will be reading it in Script Analysis in order to better understand the process of going from page to stage. I am excited to see where the semester takes us. I just received notice from my research chair that my dissertation prospectus has been approved. I am excited to begin writing my dissertation in earnest. First step: head to the library to gather the books needed for a comprehensive literature review. I have a feeling that I will be in the library a lot from now on. I just got back from working as an intern at the Allegheny Alley Fight Stage Combat Workshop in Pennsylvania. The other interns and instructors were a pleasure to work with and it was a great experience to assist Fight Master Michael Chin on a smallsword class. 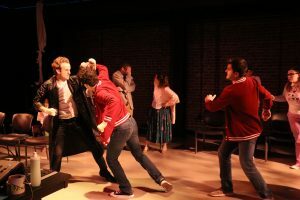 Though this workshop was smaller than the Tourist Trap Stage Combat Workshop in Orlando, all the students were collaborative and energetic in their pursuit of exciting, safe stage combat. After an eight hour written exam and a subsequent 90 minute defense I passed my qualifying exam! With this I have achieved the goal I set myself of passing my exams before the end of my 4th year in the program. Today it’s time to celebrate, tomorrow I will start writing my prospectus. 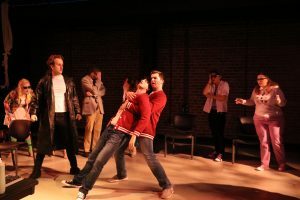 It was quite an interesting challenge to do the fight choreography for Heathers The Musical. The first fight, during the song “Fight for Me,” requires the actors to fight silently in slow motion while the other characters sing. This took away two of the fight choreographer’s most potent tools– vocalization and knapping. While initially I thought this would be an easy altercation to choreograph, the auditory restrictions caused me to modify my initial choreography and direct the three combatants to make both their attacks and physical reactions to the pain extremely clear. In the end, the fight resulted in a humorous, but realistic slow motion beating that toed the line between verisimilitude and camp, just as the director intended. Here are a few shots from the final dress rehearsal of the fight. 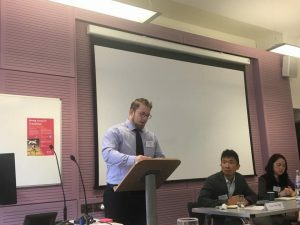 I just got back from my first trip to London to present a paper at SOAS’s Hong Kong in Transition conference on the Hong Kong theatre group Zuni Icosahedron’s East Wing, West Wing series of plays (see photo below). It was great to meet other scholars and practitioners interested in Hong Kong theatre, history, and politics. One highlight was getting to see a curated performance of both the traditional Kun Qu “Flee by Night” and the modern, experimental version directed by Danny Yung. I will try to keep in touch with them to continue our dialogues. I stuck around a few days after the conference and explored the city. I found London to be a lovely metropolis and it seemed that every time your turned your head you would see some historical building or street. 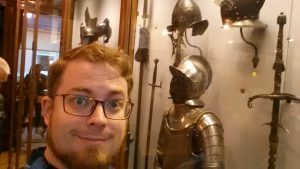 There were wonderful paintings and beautifully preserved medieval arms and armor at the Wallace Collection (see photo below). I could have spent another day in that museum. Ah well! Until next time, London! 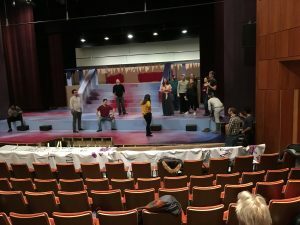 The Brown County Playhouse staged a production of the comedy Moonlight and Magnolias and I got the chance to choreograph a three-person comedic slap fight for the production. The choreography itself was a bit challenging due to the physical constraints of the older actors. Once I familiarized myself with what each actor was comfortable with, I tailored the choreography to the specific actor. The most dramatic move of the fight was a powerful slap which caused one character to fall back onto the sofa in a daze. We carefully worked out a way to safely have the actor fall back while effectively telling the story of the fight in an exciting way. Besides being tons of fun, it was the first time I had gotten paid to choreograph a fight for a professional production. I hope it will be the first of many fight choreography gigs. It has been such a great experience for me to teach Script Analysis at IU. Students seem to really respond to the plays I select for the course. Last semester we covered Antigone, Venus, The Hypochondriac, Three Sisters and The Resistible Rise of Arturo Ui, among other works. The focus of the course is on envisioning fully-realized productions and in service of that, I have built a design project and staged reading project into the syllabus. This gives students an opportunity to apply the analytical tools we have learned to the practical problem of putting a play onstage. Hopefully, they will take these tools and make use of them for the rest of their theatrical career.